Materialization is used to construct functions only as they're needed. This is useful to reduce memory usage in LLVM or parsing work done by the BitcodeReader to load the Module. Definition at line 44 of file GlobalValue.h. This is a 64 bits hash that is used by PGO and ThinLTO to have a compact unique way to identify a symbol. Definition at line 492 of file GlobalValue.h. Definition at line 69 of file GlobalValue.h. Definition at line 47 of file GlobalValue.h. Definition at line 180 of file GlobalValue.h. Definition at line 193 of file GlobalValue.h. Definition at line 62 of file GlobalValue.h. Definition at line 76 of file GlobalValue.h. Definition at line 175 of file GlobalValue.h. This is the case for linkonce_odr values whose address is not significant. While legal, it is not normally profitable to omit them from the .o symbol table. Using this analysis makes sense when the information can be passed down to the linker or we are in LTO. Definition at line 288 of file Globals.cpp. References hasAtLeastLocalUnnamedAddr(), hasGlobalUnnamedAddr(), and hasLinkOnceODRLinkage(). Referenced by canBeHidden(), and llvm::LTOModule::makeBuffer(). Definition at line 219 of file Globals.cpp. References getAlignment(), llvm::Module::getTargetTriple(), hasSection(), isDSOLocal(), isStrongDefinitionForLinker(), and Parent. Definition at line 569 of file GlobalValue.h. Copy all additional attributes (those not needed to create a GlobalValue) from the GlobalValue Src to this one. 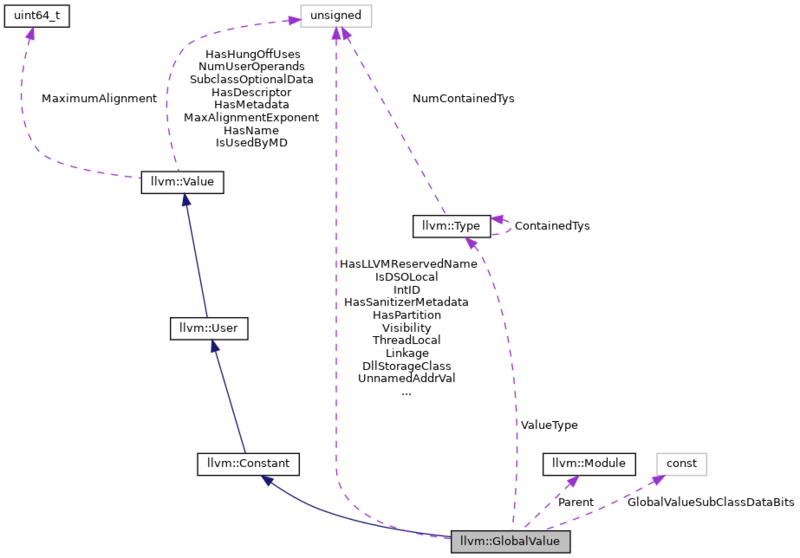 copyAttributesFrom - copy all additional attributes (those not needed to create a GlobalValue) from the GlobalValue Src to this one. Definition at line 65 of file Globals.cpp. References getDLLStorageClass(), getUnnamedAddr(), getVisibility(), isDSOLocal(), setDLLStorageClass(), setDSOLocal(), setUnnamedAddr(), and setVisibility(). Referenced by llvm::GlobalIFunc::copyAttributesFrom(), llvm::GlobalAlias::copyAttributesFrom(), and llvm::GlobalObject::copyAttributesFrom(). If the given string begins with the GlobalValue name mangling escape character '\1', drop it. This function applies a specific mangling that is used in PGO profiles, among other things. If you're trying to get a symbol name for an arbitrary GlobalValue, this is not the function you're looking for; see Mangler.h. Definition at line 471 of file GlobalValue.h. References llvm::StringRef::empty(), Name, and llvm::StringRef::substr(). Referenced by llvm::DwarfUnit::addLinkageName(), llvm::DiagnosticInfoOptimizationBase::Argument::Argument(), llvm::WinException::beginFunction(), llvm::lto::createWriteIndexesThinBackend(), llvm::AsmPrinter::EmitDebugValue(), llvm::WinException::endFunclet(), FixedPointIntrinsicToOpcode(), getMCSymbolForMBB(), llvm::DiagnosticInfoOptimizationBase::getMsg(), INITIALIZE_PASS(), instrumentMaskedLoadOrStore(), recoverFramePointer(), llvm::lto::LTO::run(), and sanitizeFunctionName(). This method unlinks 'this' from the containing module and deletes it. Definition at line 84 of file Globals.cpp. Referenced by deleteIfDead(), FunctionNumber(), getMinVisibility(), maybeSetDSOLocal(), and llvm::GlobalDCEPass::run(). If this is an absolute symbol reference, returns the range of the symbol, otherwise returns None. Definition at line 276 of file Globals.cpp. References llvm::dyn_cast(), llvm::getConstantRangeFromMetadata(), llvm::LLVMContext::MD_absolute_symbol, and llvm::None. Definition at line 110 of file Globals.cpp. Referenced by canCreateAliasFor(), canCreateThunkFor(), llvm::CloneFunction(), llvm::convertToDeclaration(), doPromotion(), llvm::CodeExtractor::findInputsOutputs(), FunctionNumber(), llvm::Module::getOrInsertFunction(), llvm::getPtrStride(), getRetComponentType(), llvm::SelectionDAG::getSymbolFunctionGlobalAddress(), INITIALIZE_PASS(), isKnownTypeIdMember(), isObjectDereferencedInBlock(), maybePrintComdat(), and UpgradeIntrinsicFunction1(). Definition at line 96 of file Globals.cpp. Referenced by llvm::AMDGPUMachineFunction::allocateLDSGlobal(), canIncreaseAlignment(), llvm::ConstantFoldBinaryInstruction(), forEachUser(), getGVAlignmentLog2(), llvm::SystemZSubtarget::isPC32DBLSymbol(), isWordAligned(), isWorthFoldingADDlow(), llvm::LTOModule::makeBuffer(), PeepholePPC64ZExtGather(), llvm::GlobalObject::setAlignment(), and swapMIOperands(). Definition at line 260 of file Globals.cpp. Referenced by llvm::AsmPrinter::emitGlobalGOTEquivs(), llvm::MipsTargetLowering::EmitInstrWithCustomInserter(), getAlignment(), getBaseObject(), getComdat(), getMinVisibility(), llvm::TargetLoweringObjectFileMachO::getNameWithPrefix(), getSection(), getSelectionForCOFF(), llvm::LanaiTargetLowering::LowerGlobalAddress(), and llvm::HexagonTargetLowering::LowerGLOBALADDRESS(). Definition at line 545 of file GlobalValue.h. Definition at line 170 of file Globals.cpp. References assert(), getBaseObject(), llvm::Value::getContext(), llvm::LLVMContextImpl::GlobalObjectSections, hasSection(), and llvm::LLVMContext::pImpl. Referenced by checkMachOComdat(), deleteIfDead(), llvm::FunctionImportGlobalProcessing::doImportAsDefinition(), llvm::filterDeadComdatFunctions(), getArrayElements(), getComdatGVForCOFF(), getELFComdat(), getMinVisibility(), getSelectionForCOFF(), getWasmComdat(), handleNonPrevailingComdat(), isEmptyFunction(), isInPartition(), optimizeGlobalsInModule(), and llvm::GlobalDCEPass::run(). Definition at line 227 of file GlobalValue.h. Definition at line 258 of file GlobalValue.h. Referenced by copyAttributesFrom(), getEncodedDLLStorageClass(), instrumentMaskedLoadOrStore(), maybePrintComdat(), and OptimizeGlobalAliases(). Return the modified name for a global value suitable to be used as the key for a global lookup (e.g. profile or ThinLTO). The value's original name is Name and has linkage of type Linkage. The value is defined in module FileName. Definition at line 131 of file Globals.cpp. References llvm::StringRef::empty(), isLocalLinkage(), Name, llvm::StringRef::str(), and llvm::StringRef::substr(). Return the modified name for this global value suitable to be used as the key for a global lookup (e.g. Definition at line 155 of file Globals.cpp. References getLinkage(), llvm::Value::getName(), and getParent(). Referenced by llvm::getPGOFuncName(), resolveFwdRef(), and llvm::thinLTOInternalizeModule(). Definition at line 160 of file GlobalValue.h. Referenced by llvm::GlobalObject::classof(), llvm::GlobalObject::getAlignment(), llvm::GlobalObject::getGlobalObjectSubClassData(), llvm::GlobalObject::hasSection(), llvm::GlobalObject::setAlignment(), and llvm::GlobalObject::setGlobalObjectSubClassData(). Definition at line 496 of file GlobalValue.h. Referenced by llvm::buildModuleSummaryIndex(), computeAliasSummary(), computeVariableSummary(), llvm::FunctionImportGlobalProcessing::doImportAsDefinition(), llvm::ModuleSummaryIndex::getGlobalValueSummary(), llvm::ModuleSummaryIndex::getOrInsertValueInfo(), and writeTypeIdSummaryRecord(). Definition at line 500 of file GlobalValue.h. Referenced by llvm::ModuleSummaryIndex::addGlobalValueSummary(), addIntrinsicToSummary(), llvm::InstrProfSymtab::create(), llvm::lto::createWriteIndexesThinBackend(), FunctionNumber(), getGUID(), llvm::sampleprof::FunctionSamples::getGUID(), llvm::ModuleSummaryIndex::getOrInsertTypeIdSummary(), llvm::sampleprof::getRepInFormat(), llvm::ModuleSummaryIndex::getTypeIdSummary(), llvm::sampleprof::FunctionSamples::GUIDToFuncNameMapper::GUIDToFuncNameMapper(), llvm::yaml::CustomMappingTraits< TypeIdSummaryMapTy >::inputOne(), resolveFwdRef(), llvm::WholeProgramDevirtPass::run(), llvm::lto::LTO::run(), setLiveRoot(), and llvm::thinLTOInternalizeModule(). Definition at line 450 of file GlobalValue.h. Referenced by canBeHidden(), canCreateAliasFor(), canCreateThunkFor(), llvm::canRenameComdatFunc(), llvm::CloneFunction(), llvm::orc::cloneFunctionDecl(), llvm::orc::cloneGlobalAliasDecl(), llvm::orc::cloneGlobalVariableDecl(), computeAliasSummary(), computeVariableSummary(), llvm::GlobalAlias::create(), llvm::createPGOFuncNameVar(), llvm::FunctionImportGlobalProcessing::doImportAsDefinition(), doPromotion(), forceRenaming(), forEachUser(), getArrayElements(), getEncodedLinkage(), getGlobalIdentifier(), llvm::getPGOFuncName(), getRetComponentType(), INITIALIZE_PASS(), instrumentMaskedLoadOrStore(), IsInterestingCmp(), isKnownTypeIdMember(), isZeroLengthArray(), lowerObjCCall(), makeVisible(), maybePrintComdat(), llvm::needsComdatForCounter(), needsRuntimeRegistrationOfSectionRange(), OptimizeGlobalAliases(), PushArgMD(), removeGlobalCtors(), replaceAliasWithAliasee(), llvm::WholeProgramDevirtPass::run(), selectJumpTableArmEncoding(), shouldFixMainFunction(), and UpgradeIntrinsicFunction1(). Definition at line 283 of file GlobalValue.h. Definition at line 217 of file GlobalValue.h. Definition at line 565 of file GlobalValue.h. Referenced by AddAlignmentAssumptions(), addBoundsChecking(), allCallersPassInValidPointerForArgument(), llvm::AMDGPUTargetLowering::analyzeFormalArgumentsCompute(), asmClobbersCTR(), llvm::Value::assertModuleIsMaterializedImpl(), buildFrameType(), callingConvSupported(), callIntrinsic(), callsShareTOCBase(), canCreateAliasFor(), canCreateThunkFor(), llvm::canRenameComdatFunc(), llvm::ARMTargetLowering::CCAssignFnForReturn(), llvm::changeToUnreachable(), llvm::AArch64Subtarget::classifyGlobalFunctionReference(), llvm::X86Subtarget::classifyGlobalFunctionReference(), llvm::PPCSubtarget::classifyGlobalReference(), llvm::AArch64Subtarget::ClassifyGlobalReference(), llvm::X86Subtarget::classifyGlobalReference(), llvm::CloneAndPruneIntoFromInst(), llvm::CloneBasicBlock(), llvm::CloneFunction(), llvm::CloneFunctionInto(), llvm::FunctionComparator::cmpOperations(), llvm::FunctionComparator::cmpTypes(), combineADDToADDZE(), combineInstructionsOverFunction(), CompareValueComplexity(), llvm::computeLegalValueVTs(), ComputePostOrders(), llvm::ConstantFoldBinaryInstruction(), llvm::ConstantFoldCall(), ConvertDoubleToBytes(), llvm::convertToDeclaration(), copyComdat(), llvm::SanitizerStatReport::create(), llvm::GlobalAlias::create(), llvm::createAMDGPUFunctionInliningPass(), llvm::IRBuilderBase::CreateAssumption(), createClone(), llvm::createCodeGenPreparePass(), llvm::createConstantPropagationPass(), llvm::IRBuilderBase::CreateElementUnorderedAtomicMemCpy(), llvm::IRBuilderBase::CreateElementUnorderedAtomicMemMove(), llvm::IRBuilderBase::CreateElementUnorderedAtomicMemSet(), llvm::IRBuilderBase::CreateFAddReduce(), createFFSIntrinsic(), llvm::IRBuilderBase::CreateFMulReduce(), llvm::IRBuilderBase::CreateGCRelocate(), llvm::IRBuilderBase::CreateGCResult(), CreateGCStatepointCallCommon(), CreateGCStatepointInvokeCommon(), llvm::IRBuilderBase::CreateGlobalString(), llvm::createHWAddressSanitizerPass(), llvm::IRBuilderBase::CreateInvariantStart(), llvm::createLegacyPMBasicAAResult(), llvm::IRBuilderBase::CreateLifetimeEnd(), llvm::IRBuilderBase::CreateLifetimeStart(), llvm::IRBuilderBase::CreateMaskedStore(), llvm::IRBuilderBase::CreateMemCpy(), llvm::createMemDerefPrinter(), llvm::IRBuilderBase::CreateMemMove(), llvm::IRBuilderBase::CreateMemSet(), llvm::createPGOFuncNameVar(), createPopcntIntrinsic(), llvm::createPPCCTRLoopsVerify(), llvm::createSampleProfileLoaderPass(), llvm::createScalarizerPass(), llvm::createShadowStackGCLoweringPass(), CreateVarArgHelper(), createWrapper(), llvm::VerifierSupport::DebugInfoCheckFailed(), llvm::DemoteRegToStack(), llvm::FunctionImportGlobalProcessing::doImportAsDefinition(), doPromotion(), dumpIR(), eliminateTailRecursion(), llvm::AsmPrinter::EmitAlignment(), llvm::AArch64TargetLowering::emitAtomicCmpXchgNoStoreLLBalance(), llvm::ARMTargetLowering::emitAtomicCmpXchgNoStoreLLBalance(), llvm::AsmPrinter::EmitDebugValue(), llvm::AsmPrinter::EmitGlobalVariable(), llvm::AMDGPU::HSAMD::MetadataStreamerV2::emitKernel(), llvm::emitLinkerFlagsForGlobalCOFF(), llvm::HexagonTargetLowering::emitLoadLinked(), llvm::AArch64TargetLowering::emitLoadLinked(), llvm::ARMTargetLowering::emitLoadLinked(), llvm::AsmPrinter::EmitSpecialLLVMGlobal(), llvm::HexagonTargetLowering::emitStoreConditional(), llvm::AArch64TargetLowering::emitStoreConditional(), llvm::ARMTargetLowering::emitStoreConditional(), llvm::PPCTargetLowering::emitTrailingFence(), enableCallSafepoints(), ensurePromotedGV(), eraseDeadBBsAndChildren(), llvm::GlobalIFunc::eraseFromParent(), llvm::GlobalAlias::eraseFromParent(), llvm::GlobalVariable::eraseFromParent(), explicifyGuards(), llvm::CodeExtractor::extractCodeRegion(), llvm::findAllNVVMAnnotation(), findCalledFunction(), llvm::findDevirtualizableCallsForTypeTest(), llvm::AnalysisResolver::findImplPass(), llvm::findOneNVVMAnnotation(), findUser(), FixedPointIntrinsicToOpcode(), forceRenaming(), forEachUser(), llvm::StackSafetyInfo::FunctionInfo::FunctionInfo(), generateUnsignedDivisionCode(), getAlignment(), llvm::getBestSimplifyQuery(), llvm::CallSiteBase< Function, BasicBlock, Value, User, Use, Instruction, CallInst, InvokeInst, CallBrInst, User::op_iterator >::getCaller(), getChainID(), getComdatGVForCOFF(), llvm::MachineFunction::getDataLayout(), llvm::ScalarEvolution::getDataLayout(), getDebugLocString(), llvm::TargetLoweringBase::getDefaultSafeStackPointerLocation(), llvm::AMDGPUSubtarget::getExplicitKernArgSize(), getFirstNonAllocaInTheEntryBlock(), getGlobalIdentifier(), GetGlobalTypeString(), llvm::getInlineCost(), llvm::TargetLoweringBase::getIRStackGuard(), llvm::TargetLibraryInfoImpl::getLibFunc(), getLoadStackGuard(), llvm::ExecutionEngine::getMangledName(), getMinVisibility(), llvm::GlobalsAAResult::getModRefBehavior(), llvm::Trace::getModule(), llvm::BasicBlock::getModule(), getModuleFromVal(), getMOVL(), llvm::Mangler::getNameWithPrefix(), llvm::GetOrCreateFunctionComdat(), llvm::CallGraph::getOrInsertFunction(), getOutliningPenalty(), getParent(), getParentPad(), llvm::getPGOFuncName(), llvm::PPCTargetLowering::getPICJumpTableRelocBaseExpr(), getPointerOperands(), llvm::MCJIT::getPointerToFunction(), llvm::NVPTXTargetLowering::getPrototype(), getReductionIntrinsic(), llvm::SCEVExpander::getRelatedExistingExpansion(), getRetComponentType(), llvm::TargetLoweringBase::getSafeStackPointerLocation(), getScalarIntrinsicDeclaration(), llvm::TargetLoweringObjectFile::getSectionForJumpTable(), getSignature(), getSqrtCall(), llvm::SelectionDAG::getSymbolFunctionGlobalAddress(), llvm::TargetLoweringObjectFile::getSymbolWithGlobalValueBase(), llvm::MipsTargetMachine::getTargetTransformInfo(), llvm::TargetMachine::getTargetTransformInfo(), llvm::HexagonTargetLowering::getTgtMemIntrinsic(), llvm::ARMTargetLowering::getTgtMemIntrinsic(), llvm::TargetMachine::getTLSModel(), llvm::FunctionLoweringInfo::getValueFromVirtualReg(), getVarName(), llvm::GlobalVariable::GlobalVariable(), llvm::MipsCallLowering::MipsHandler::handle(), llvm::CallLowering::handleAssignments(), HandleByValArgument(), llvm::PPCSubtarget::hasLazyResolverStub(), hasProfileData(), hasReturnsTwiceAttr(), hasUndefContents(), llvm::inferLibFuncAttributes(), INITIALIZE_PASS(), llvm::MIRParserImpl::initializeConstantPool(), initSlots2BasicBlocks(), initSlots2Values(), llvm::InlineFunction(), insertCall(), insertIfNamed(), insertLifetimeMarkersSurroundingCall(), insertSinCosCall(), instrumentMaskedLoadOrStore(), llvm::isAllocaPromotable(), isAtomic(), isFuncOrArgAttr(), llvm::RISCVELFTargetObjectFile::isGlobalInSmallSection(), llvm::MipsTargetObjectFile::IsGlobalInSmallSection(), llvm::ARMSubtarget::isGVIndirectSymbol(), llvm::ARMSubtarget::isGVInGOT(), llvm::isImageReadOnly(), llvm::isImageReadWrite(), llvm::isImageWriteOnly(), IsInterestingCmp(), llvm::isLegalToPromote(), llvm::TargetLowering::isOffsetFoldingLegal(), IsOperandAMemoryOperand(), llvm::SystemZSubtarget::isPC32DBLSymbol(), isPointerValueDeadOnEntryToFunction(), llvm::ARMTargetLowering::isReadOnly(), isReportingError(), llvm::isSampler(), IsSmallObject(), isTargetConstant(), isZeroLengthArray(), llvm::lintFunction(), LLVMGetNextFunction(), LLVMGetNextGlobal(), LLVMGetNextGlobalAlias(), LLVMGetNextGlobalIFunc(), LLVMGetPreviousFunction(), LLVMGetPreviousGlobal(), LLVMGetPreviousGlobalAlias(), LLVMGetPreviousGlobalIFunc(), llvm::X86CallLowering::lowerCall(), llvm::AArch64CallLowering::lowerCall(), llvm::MipsCallLowering::lowerCall(), llvm::CallLowering::lowerCall(), llvm::AsmPrinter::lowerConstant(), llvm::LowerDbgDeclare(), LowerEXTRACT_SUBVECTOR(), llvm::AMDGPUCallLowering::lowerFormalArguments(), llvm::AArch64CallLowering::lowerFormalArguments(), lowerGuardIntrinsic(), lowerObjCCall(), llvm::AMDGPUCallLowering::lowerReturn(), llvm::AArch64CallLowering::lowerReturn(), llvm::TargetLowering::LowerToTLSEmulatedModel(), lowerWidenableCondition(), LowerWRITE_REGISTER(), llvm::SparcTargetLowering::makeAddress(), llvm::ARMTargetLowering::makeDMB(), makeStatepointExplicitImpl(), llvm::orc::makeStub(), MarkBlocksLiveIn(), llvm::X86TargetLowering::markLibCallAttributes(), materialize(), maybePrintComdat(), mayLoopAccessLocation(), mayUseP9Setb(), memOpsHaveSameBasePtr(), mergeInlinedArrayAllocas(), llvm::orc::moveFunctionBody(), llvm::orc::moveGlobalVariableInitializer(), normalizePBQPSpillWeight(), OptimizeGlobalAddressOfMalloc(), llvm::cflaa::parentFunctionOfValue(), patchAndReplaceAllUsesWith(), performGlobalAddressCombine(), PerformHeapAllocSRoA(), postSplitCleanup(), PrepareCall(), prepareForSplit(), llvm::MIRPrinter::print(), llvm::Value::print(), llvm::MachineBasicBlock::print(), llvm::MachineInstr::print(), printMemOperand(), processInternalGlobal(), RedzoneSizeForScale(), relocationViaAlloca(), llvm::Intrinsic::remangleIntrinsicFunction(), llvm::GlobalIFunc::removeFromParent(), llvm::GlobalAlias::removeFromParent(), llvm::GlobalVariable::removeFromParent(), removeGlobalCtors(), replaceDevirtTrigger(), RetagMask(), llvm::returnTypeIsEligibleForTailCall(), llvm::LoopFusePass::run(), llvm::NewGVNPass::run(), llvm::ScalarizerPass::run(), llvm::ControlHeightReductionPass::run(), llvm::IndVarSimplifyPass::run(), llvm::LoopLoadEliminationPass::run(), llvm::ThreadSanitizerPass::run(), llvm::EarlyCSEPass::run(), llvm::InstCombinePass::run(), llvm::InstSimplifyPass::run(), llvm::SCCPPass::run(), llvm::MemorySanitizerPass::run(), llvm::AAEvaluator::run(), llvm::AMDGPUAA::run(), llvm::objcarc::ObjCARCAA::run(), llvm::AddressSanitizerPass::run(), llvm::PrintFunctionPass::run(), llvm::LoopUnrollPass::run(), llvm::ConstantHoistingPass::run(), llvm::LazyValueAnalysis::run(), llvm::LoopVectorizePass::run(), llvm::BasicAA::run(), llvm::TargetLibraryAnalysis::run(), llvm::AAManager::run(), llvm::TargetIRAnalysis::run(), llvm::MCJIT::runFunction(), llvm::Float2IntPass::runImpl(), llvm::SLPVectorizerPass::runImpl(), llvm::JumpThreadingPass::runImpl(), llvm::NaryReassociatePass::runImpl(), llvm::ConstantHoistingPass::runImpl(), runImpl(), llvm::LegacyDivergenceAnalysis::runOnFunction(), llvm::LPPassManager::runOnFunction(), llvm::StackProtector::runOnFunction(), llvm::LazyValueInfoWrapperPass::runOnFunction(), llvm::BasicAAWrapperPass::runOnFunction(), llvm::FPPassManager::runOnFunction(), LoopFuseLegacy::runOnFunction(), llvm::IRTranslator::runOnMachineFunction(), llvm::ScalarEvolution::ScalarEvolution(), selectELFSectionForGlobal(), llvm::XCoreTargetObjectFile::SelectSectionForGlobal(), llvm::TargetLoweringObjectFileMachO::SelectSectionForGlobal(), setFastFlags(), setUsedInitializer(), shouldApply(), llvm::HexagonTargetObjectFile::shouldPutJumpTableInFunctionSection(), ShrinkDemandedConstant(), simplifyCFG(), splitGlobal(), SRAGlobal(), StackMallocSizeClass(), SwitchToLookupTable(), TryToShrinkGlobalToBoolean(), TypeSizeToSizeIndex(), unifyReturnBlockSet(), unswitchBestCondition(), llvm::UpgradeIntrinsicCall(), UpgradeIntrinsicFunction1(), UpgradePTESTIntrinsic(), UpgradeX86IntrinsicFunction(), UpgradeX86IntrinsicsWith8BitMask(), usedInOneFunc(), useFuncSeen(), UseTlsOffset(), verifyAddrSpace(), llvm::verifyFunction(), VisitGlobalVariableForEmission(), llvm::SelectionDAGBuilder::visitSPDescriptorParent(), and llvm::InnerLoopVectorizer::widenInstruction(). Definition at line 566 of file GlobalValue.h. Definition at line 160 of file Globals.cpp. Referenced by callsShareTOCBase(), and llvm::XCoreTargetLowering::ReplaceNodeResults(). Definition at line 254 of file GlobalValue.h. Referenced by llvm::orc::cloneGlobalVariableDecl(), llvm::convertToDeclaration(), llvm::GlobalVariable::copyAttributesFrom(), forceRenaming(), getArrayElements(), getEncodedThreadLocalMode(), getSelectedTLSModel(), INITIALIZE_PASS(), instrumentMaskedLoadOrStore(), LowerToTLSExecModel(), maybePrintComdat(), OptimizeGlobalAddressOfMalloc(), PerformHeapAllocSRoA(), removeGlobalCtors(), SRAGlobal(), and TryToShrinkGlobalToBoolean(). Definition at line 273 of file GlobalValue.h. Referenced by llvm::MachineIRBuilder::buildGlobalValue(), llvm::Interpreter::callExternalFunction(), canCreateAliasFor(), canDemoteGlobalVar(), CheckMACMemory(), llvm::orc::cloneGlobalAliasDecl(), llvm::orc::cloneGlobalVariableDecl(), llvm::convertToDeclaration(), llvm::GlobalAlias::create(), llvm::createDeadArgHackingPass(), llvm::NVPTXAsmPrinter::doFinalization(), llvm::AsmPrinter::emitGlobalGOTEquivs(), llvm::ExecutionEngine::emitGlobals(), llvm::AsmPrinter::EmitGlobalVariable(), findInitTrampoline(), findUser(), findUses(), llvm::SanitizerStatReport::finish(), forceRenaming(), forEachUser(), FunctionNumber(), getAddressSpace(), getArrayElements(), getComparePred(), llvm::SelectionDAG::getGlobalAddress(), getImplicitScaleFactor(), getOpenCLAlignment(), llvm::Module::getOrInsertFunction(), llvm::Module::getOrInsertGlobal(), getTypeNamePrefix(), llvm::SelectionDAG::InferPtrAlignment(), INITIALIZE_PASS(), llvm::IsConstantOffsetFromGlobal(), isEligibleForMerging(), llvm::AMDGPU::isGlobalSegment(), llvm::AMDGPU::isGroupSegment(), isKnownTypeIdMember(), isNoWrap(), llvm::AMDGPU::isReadOnlySegment(), isUnmergeableGlobal(), isZeroLengthArray(), llvm::BlockAddress::lookup(), llvm::TargetLoweringObjectFileELF::lowerRelativeReference(), llvm::TargetLoweringObjectFileCOFF::lowerRelativeReference(), llvm::TargetLoweringObjectFileWasm::lowerRelativeReference(), llvm::orc::makeStub(), maybePrintComdat(), maybeSetDSOLocal(), MergeAliasResults(), OptimizeGlobalAliases(), PerformHeapAllocSRoA(), processInternalGlobal(), removeGlobalCtors(), replaceAliasWithAliasee(), RetagMask(), selectJumpTableArmEncoding(), llvm::GlobalAlias::setAliasee(), llvm::HexagonTargetObjectFile::shouldPutJumpTableInFunctionSection(), splitGlobal(), SRAGlobal(), TryToShrinkGlobalToBoolean(), llvm::ObjectSizeOffsetVisitor::visitGlobalVariable(), and wrapConstantAsMetadata(). Definition at line 212 of file GlobalValue.h. Referenced by copyAttributesFrom(), getEncodedUnnamedAddr(), getMinVisibility(), maybePrintComdat(), and processGlobal(). Definition at line 275 of file GlobalValue.h. Referenced by llvm::AMDGPUMachineFunction::allocateLDSGlobal(), callingConvSupported(), llvm::orc::cloneFunctionDecl(), llvm::orc::cloneGlobalAliasDecl(), llvm::orc::cloneGlobalVariableDecl(), llvm::convertToDeclaration(), llvm::IRBuilder< TargetFolder >::CreateGlobalStringPtr(), despeculateCountZeros(), llvm::NVPTXAsmPrinter::doFinalization(), llvm::ExecutionEngine::EmitGlobalVariable(), llvm::emitLinkerFlagsForGlobalCOFF(), ensurePromotedGV(), findUser(), forceRenaming(), forEachUser(), llvm::StackSafetyInfo::FunctionInfo::FunctionInfo(), getArrayElements(), GetGlobalTypeString(), getMinVisibility(), getOrInsertValueProfilingCall(), llvm::DataLayout::getPreferredAlignment(), getTypeNamePrefix(), INITIALIZE_PASS(), InsertSafepointPoll(), instrumentMaskedLoadOrStore(), llvm::RISCVELFTargetObjectFile::isGlobalInSmallSection(), llvm::MipsTargetObjectFile::IsGlobalInSmallSection(), isKnownTypeIdMember(), isLeakCheckerRoot(), IsSmallObject(), isWorthFoldingADDlow(), isZeroLengthArray(), llvm::TargetLoweringObjectFileELF::lowerRelativeReference(), llvm::TargetLoweringObjectFileWasm::lowerRelativeReference(), maybePrintComdat(), maybeSetDSOLocal(), OptimizeGlobalAddressOfMalloc(), performGlobalAddressCombine(), processInternalGlobal(), llvm::XCoreTargetLowering::ReplaceNodeResults(), selectJumpTableArmEncoding(), llvm::XCoreTargetObjectFile::SelectSectionForGlobal(), llvm::GlobalVariable::setInitializer(), shouldKeepInEntry(), SRAGlobal(), TryToShrinkGlobalToBoolean(), and llvm::ExecutionEngine::~ExecutionEngine(). Definition at line 232 of file GlobalValue.h. Referenced by canCreateAliasFor(), copyAttributesFrom(), llvm::AsmPrinter::EmitDebugValue(), llvm::AsmPrinter::emitGlobalGOTEquivs(), llvm::AsmPrinter::EmitGlobalVariable(), getArrayElements(), getEncodedVisibility(), getMinVisibility(), instrumentMaskedLoadOrStore(), isKnownTypeIdMember(), maybePrintComdat(), needsRuntimeRegistrationOfSectionRange(), OptimizeGlobalAliases(), llvm::WholeProgramDevirtPass::run(), selectJumpTableArmEncoding(), and shouldFixMainFunction(). Definition at line 286 of file GlobalValue.h. Definition at line 432 of file GlobalValue.h. Referenced by computeVariableSummary(), llvm::NVPTXAsmPrinter::doFinalization(), llvm::AsmPrinter::EmitSpecialLLVMGlobal(), forEachUser(), getArrayElements(), getMinVisibility(), and getTypeNamePrefix(). Returns true if this value's address is not significant in this module. This attribute is intended to be used only by the code generator and LTO to allow the linker to decide whether the global needs to be in the symbol table. It should probably not be used in optimizations, as the value may have uses outside the module; use hasGlobalUnnamedAddr() instead. Definition at line 208 of file GlobalValue.h. Referenced by canBeOmittedFromSymbolTable(), and llvm::AsmPrinter::doFinalization(). Definition at line 422 of file GlobalValue.h. Referenced by computeVariableSummary(), llvm::NVPTXAsmPrinter::doFinalization(), llvm::AsmPrinter::EmitSpecialLLVMGlobal(), forEachUser(), llvm::TargetLoweringObjectFile::getKindForGlobal(), getMinVisibility(), llvm::MCJIT::getPointerToFunction(), INITIALIZE_PASS(), isEligibleForMerging(), llvm::LanaiTargetObjectFile::isGlobalInSmallSection(), llvm::MipsTargetObjectFile::IsGlobalInSmallSection(), and shouldRecordFunctionAddr(). Definition at line 225 of file GlobalValue.h. Referenced by callsShareTOCBase(), forEachUser(), and llvm::LTOModule::makeBuffer(). Definition at line 439 of file GlobalValue.h. Referenced by llvm::X86Subtarget::classifyLocalReference(), llvm::NVPTXAsmPrinter::doFinalization(), llvm::AsmPrinter::EmitGlobalVariable(), forEachUser(), llvm::JITSymbolFlags::fromGlobalValue(), llvm::HexagonTargetObjectFile::getExplicitSectionGlobal(), getMinVisibility(), getSuccPad(), llvm::PPCSubtarget::hasLazyResolverStub(), llvm::RISCVELFTargetObjectFile::isGlobalInSmallSection(), llvm::MipsTargetObjectFile::IsGlobalInSmallSection(), llvm::ARMSubtarget::isGVIndirectSymbol(), llvm::LTOModule::makeBuffer(), and llvm::HexagonTargetObjectFile::SelectSectionForGlobal(). Definition at line 233 of file GlobalValue.h. Referenced by forEachUser(), getMOVL(), inferDSOLocal(), PrintDSOLocation(), and llvm::TargetMachine::shouldAssumeDSOLocal(). Definition at line 264 of file GlobalValue.h. Referenced by computeVariableSummary(), and llvm::emitLinkerFlagsForGlobalCOFF(). Definition at line 261 of file GlobalValue.h. Referenced by llvm::DwarfCompileUnit::addLocationAttribute(), llvm::ARMTargetLowering::CCAssignFnForReturn(), llvm::X86Subtarget::classifyGlobalFunctionReference(), llvm::AArch64Subtarget::ClassifyGlobalReference(), llvm::X86Subtarget::classifyGlobalReference(), llvm::AsmPrinter::doFinalization(), llvm::FunctionImportGlobalProcessing::doImportAsDefinition(), forEachUser(), getMinVisibility(), getOffsetFromIndices(), llvm::ARMTargetLowering::isReadOnly(), and llvm::TargetMachine::shouldAssumeDSOLocal(). Definition at line 406 of file GlobalValue.h. Referenced by llvm::canTrackReturnsInterprocedurally(), llvm::createDeadArgHackingPass(), instrumentMaskedLoadOrStore(), and runImpl(). Definition at line 421 of file GlobalValue.h. Referenced by canCreateAliasFor(), llvm::NVPTXAsmPrinter::doFinalization(), llvm::AsmPrinter::emitGlobalGOTEquivs(), llvm::ExecutionEngine::emitGlobals(), llvm::RecordStreamer::flushSymverDirectives(), forEachUser(), llvm::HexagonTargetObjectFile::getExplicitSectionGlobal(), getMinVisibility(), isCalleeLoad(), llvm::RISCVELFTargetObjectFile::isGlobalInSmallSection(), llvm::MipsTargetObjectFile::IsGlobalInSmallSection(), isSortedByValueNo(), llvm::TargetLoweringObjectFileCOFF::lowerRelativeReference(), maybePrintComdat(), llvm::HexagonTargetObjectFile::SelectSectionForGlobal(), and llvm::TargetLoweringObjectFileMachO::SelectSectionForGlobal(). Definition at line 436 of file GlobalValue.h. Referenced by llvm::AArch64Subtarget::ClassifyGlobalReference(), llvm::ExecutionEngine::emitGlobals(), forceRenaming(), forEachUser(), getMinVisibility(), llvm::MCJIT::getPointerToFunction(), inferDSOLocal(), llvm::LTOModule::makeBuffer(), MatchingStackOffset(), mayTailCallThisCC(), PrintDSOLocation(), llvm::TargetMachine::shouldAssumeDSOLocal(), and unpackF64OnRV32DSoftABI(). Definition at line 199 of file GlobalValue.h. Referenced by canBeOmittedFromSymbolTable(), canCreateAliasFor(), getArrayElements(), IsBetterCanonical(), isFuncOrArgAttr(), isGOTEquivalentCandidate(), llvm::TargetLoweringObjectFileELF::lowerRelativeReference(), llvm::TargetLoweringObjectFileWasm::lowerRelativeReference(), makeMergeable(), and processGlobal(). Definition at line 234 of file GlobalValue.h. Referenced by llvm::JITSymbolFlags::fromGlobalValue(), and llvm::LTOModule::makeBuffer(). Definition at line 433 of file GlobalValue.h. Referenced by addNoRecurseAttrsTopDown(), canDemoteGlobalVar(), CC_MipsO32_FP64(), llvm::AArch64Subtarget::classifyGlobalFunctionReference(), deduceFunctionAttributeInRPO(), llvm::NVPTXAsmPrinter::doFinalization(), llvm::X86AsmPrinter::EmitFunctionBodyEnd(), llvm::HexagonTargetObjectFile::getExplicitSectionGlobal(), getModifierVariantKind(), GetSymbolFromOperand(), llvm::ARMAsmPrinter::runOnMachineFunction(), and llvm::HexagonTargetObjectFile::SelectSectionForGlobal(). Definition at line 425 of file GlobalValue.h. Referenced by canCreateAliasFor(), llvm::NVPTXAsmPrinter::doFinalization(), llvm::AsmPrinter::emitGlobalGOTEquivs(), llvm::JITSymbolFlags::fromGlobalValue(), getMinVisibility(), llvm::LTOModule::makeBuffer(), makeVisible(), and shouldRecordFunctionAddr(). Definition at line 426 of file GlobalValue.h. Referenced by canBeOmittedFromSymbolTable(), llvm::AArch64InstrInfo::isFunctionSafeToOutlineFrom(), llvm::X86InstrInfo::isFunctionSafeToOutlineFrom(), and shouldBeDeferred(). Definition at line 435 of file GlobalValue.h. Referenced by asmClobbersCTR(), canCreateAliasFor(), llvm::canTrackArgumentsInterprocedurally(), llvm::canTrackGlobalVariableInterprocedurally(), CC_MipsO32_FP64(), llvm::createDeadArgHackingPass(), llvm::createX86IndirectBranchTrackingPass(), deleteIfDead(), llvm::AsmPrinter::doFinalization(), llvm::FunctionImportGlobalProcessing::doImportAsDefinition(), llvm::AsmPrinter::emitGlobalGOTEquivs(), externalize(), llvm::RecordStreamer::flushSymverDirectives(), forceRenaming(), forEachUser(), llvm::JITSymbolFlags::fromGlobalValue(), getArrayElements(), llvm::TargetLoweringObjectFileMachO::getCFIPersonalitySymbol(), llvm::HexagonTargetObjectFile::getExplicitSectionGlobal(), llvm::getIntrinsicForCallSite(), getMinVisibility(), llvm::GlobalsAAResult::getModRefBehavior(), llvm::GlobalsAAResult::getModRefInfo(), getMOVL(), llvm::GetOrCreateFunctionComdat(), getRetComponentType(), llvm::SparcELFTargetObjectFile::getTTypeGlobalReference(), llvm::TargetLoweringObjectFileELF::getTTypeGlobalReference(), llvm::TargetLoweringObjectFileMachO::getTTypeGlobalReference(), handleNonPrevailingComdat(), hasOnlyColdCalls(), hasUsesToReplace(), inferDSOLocal(), INITIALIZE_PASS(), instrumentMaskedLoadOrStore(), IsBetterCanonical(), isDirectCall(), isFuncOrderCorrect(), llvm::MipsTargetObjectFile::IsGlobalInSmallSection(), llvm::TargetTransformInfoImplBase::isLoweredToCall(), isNonRenamableLocal(), llvm::TargetFrameLowering::isSafeForNoCSROpt(), llvm::LTOModule::makeBuffer(), makeVisible(), llvm::maybeMarkSanitizerLibraryCallNoBuiltin(), mayHaveOtherReferences(), mergeConstants(), OptimizeFunctions(), OptimizeGlobalAliases(), OptimizeGlobalVars(), llvm::LinkDiagnosticInfo::print(), PrintDSOLocation(), processGlobal(), promoteArguments(), llvm::LegacyInlinerBase::removeDeadFunctions(), replace(), llvm::XCoreTargetLowering::ReplaceNodeResults(), llvm::InlinerPass::run(), llvm::WholeProgramDevirtPass::run(), llvm::X86AsmPrinter::runOnMachineFunction(), llvm::ExecutionEngine::runStaticConstructorsDestructors(), llvm::FastISel::selectInstruction(), selectJumpTableArmEncoding(), llvm::HexagonTargetObjectFile::SelectSectionForGlobal(), llvm::XCoreTargetObjectFile::SelectSectionForGlobal(), shouldBeDeferred(), shouldRecordFunctionAddr(), splitGlobal(), and SRAGlobal(). Definition at line 434 of file GlobalValue.h. Referenced by llvm::NVPTXAsmPrinter::doFinalization(), llvm::AsmPrinter::emitGlobalGOTEquivs(), llvm::HexagonTargetObjectFile::getExplicitSectionGlobal(), llvm::TargetLoweringObjectFileCOFF::getExplicitSectionGlobal(), llvm::Mangler::getNameWithPrefix(), llvm::TargetLoweringObjectFileCOFF::getNameWithPrefix(), llvm::TargetMachine::getNameWithPrefix(), llvm::TargetLoweringObjectFileCOFF::getSectionForJumpTable(), instrumentMaskedLoadOrStore(), isLeakCheckerRoot(), llvm::HexagonTargetObjectFile::SelectSectionForGlobal(), llvm::TargetLoweringObjectFileMachO::SelectSectionForGlobal(), and llvm::TargetLoweringObjectFileCOFF::SelectSectionForGlobal(). Definition at line 235 of file GlobalValue.h. Definition at line 269 of file GlobalValue.h. Referenced by canIncreaseAlignment(), llvm::FunctionImportGlobalProcessing::doImportAsDefinition(), getComdat(), getGVAlignmentLog2(), isNonRenamableLocal(), llvm::TargetLoweringObjectFileCOFF::lowerRelativeReference(), llvm::LTOModule::makeBuffer(), llvm::XCoreTargetLowering::ReplaceNodeResults(), and llvm::GlobalObject::setSection(). Definition at line 440 of file GlobalValue.h. Definition at line 430 of file GlobalValue.h. Definition at line 429 of file GlobalValue.h. Referenced by canCreateAliasFor(), llvm::NVPTXAsmPrinter::doFinalization(), llvm::AsmPrinter::emitGlobalGOTEquivs(), llvm::JITSymbolFlags::fromGlobalValue(), getMinVisibility(), and llvm::LTOModule::makeBuffer(). Definition at line 431 of file GlobalValue.h. Returns whether this is a reference to an absolute symbol. Definition at line 268 of file Globals.cpp. References llvm::dyn_cast(), llvm::GlobalObject::getMetadata(), and llvm::LLVMContext::MD_absolute_symbol. Definition at line 311 of file GlobalValue.h. Definition at line 293 of file GlobalValue.h. Definition at line 326 of file GlobalValue.h. Return true if the primary definition of this global value is outside of the current translation unit. Definition at line 205 of file Globals.cpp. Referenced by addNoRecurseAttrs(), addNoRecurseAttrsTopDown(), assureFPCallStub(), llvm::buildModuleSummaryIndex(), llvm::Interpreter::callFunction(), callsiteIsHot(), llvm::createAlwaysInlinerLegacyPass(), llvm::createAMDGPUFunctionInliningPass(), llvm::createDeadArgHackingPass(), cxxDtorIsEmpty(), deduceFunctionAttributeInRPO(), deleteIfDead(), doCallSiteSplitting(), llvm::NVPTXAsmPrinter::doFinalization(), llvm::FunctionImportGlobalProcessing::doImportAsDefinition(), llvm::AsmPrinter::EmitGlobalVariable(), llvm::emitLinkerFlagsForGlobalCOFF(), emitSignedInt64(), enableCallSafepoints(), llvm::Evaluator::EvaluateBlock(), llvm::ExecutionEngine::FindFunctionNamed(), llvm::ExecutionEngine::FindGlobalVariableNamed(), llvm::AnalysisResolver::findImplPass(), llvm::MCJIT::findModuleForSymbol(), forceRenaming(), forEachUser(), FunctionNumber(), getArrayElements(), llvm::AMDGPULibFunc::getFunction(), llvm::GCModuleInfo::getFunctionInfo(), llvm::TargetLoweringObjectFile::getKindForGlobal(), getMinVisibility(), llvm::AMDGPULibFunc::getOrInsertFunction(), getParentPad(), llvm::MCJIT::getPointerToFunction(), getSignature(), hasAnyNonFlatUseOfReg(), llvm::GlobalVariable::hasInitializer(), hasProfileData(), INITIALIZE_PASS(), llvm::InlineFunction(), invokeFunctionPass(), isEligibleForMerging(), llvm::RISCVELFTargetObjectFile::isGlobalInSmallSection(), llvm::LanaiTargetObjectFile::isGlobalInSmallSection(), llvm::MipsTargetObjectFile::IsGlobalInSmallSection(), isReportingError(), isWrapperOnlyCall(), llvm::lintFunction(), llvm::AMDGPUArgumentUsageInfo::lookupFuncArgInfo(), llvm::orc::makeStub(), maybePrintComdat(), llvm::orc::moveFunctionBody(), OptimizeFunctions(), OptimizeGlobalAliases(), OptimizeGlobalVars(), predictUseListOrder(), llvm::LegacyInlinerBase::removeDeadFunctions(), llvm::SyntheticCountsPropagation::run(), llvm::RewriteStatepointsForGC::runOnFunction(), llvm::FPPassManager::runOnFunction(), llvm::MCJIT::runStaticConstructorsDestructors(), llvm::ExecutionEngine::runStaticConstructorsDestructors(), llvm::ImportedFunctionsInliningStatistics::setModuleInfo(), shouldFixMainFunction(), stripDeadPrototypes(), useFuncSeen(), llvm::verifyModule(), llvm::Interpreter::visitCallSite(), llvm::LazyCallGraph::visitReferences(), writeIdentificationBlock(), and writeTypeIdSummaryRecord(). Definition at line 523 of file GlobalValue.h. Referenced by llvm::X86Subtarget::classifyLocalReference(), llvm::AsmPrinter::EmitSpecialLLVMGlobal(), llvm::RecordStreamer::flushSymverDirectives(), forEachUser(), getArrayElements(), getMinVisibility(), llvm::PPCSubtarget::hasLazyResolverStub(), llvm::ARMSubtarget::isGVIndirectSymbol(), isKnownTypeIdMember(), and llvm::TargetMachine::shouldAssumeDSOLocal(). Return true if the currently visible definition of this global (if any) is exactly the definition we will see at runtime. However, we cannot infer readnone for foo, since that would justify DSE'ing a store to v across a call to foo, which can cause undefined behavior if the linker replaces the actual call destination with the unoptimized foo. Inlining is okay across non-exact linkage types as long as they're not interposable (see isInterposable), since in such cases the currently visible variant is a correct implementation of the original source function; it just isn't the only correct implementation. Definition at line 401 of file GlobalValue.h. Whether the definition of this global may be discarded if it is not used in its compilation unit. Definition at line 360 of file GlobalValue.h. Referenced by canCreateAliasFor(), deleteIfDead(), isGOTEquivalentCandidate(), makeVisible(), and optimizeGlobalsInModule(). Definition at line 452 of file GlobalValue.h. Definition at line 279 of file GlobalValue.h. Referenced by llvm::buildModuleSummaryIndex(), canIncreaseAlignment(), computeAliasSummary(), computeVariableSummary(), copyAttributesFrom(), forEachUser(), isDirectCall(), llvm::StackSafetyInfo::FunctionInfo::IsDSOLocal(), isKnownTypeIdMember(), OptimizeGlobalAliases(), PrintDSOLocation(), and llvm::TargetMachine::shouldAssumeDSOLocal(). Definition at line 290 of file GlobalValue.h. Definition at line 323 of file GlobalValue.h. Definition at line 314 of file GlobalValue.h. Return true if this global's definition can be substituted with an arbitrary definition at link time. We cannot do any IPO or inlinining across interposable call edges, since the callee can be replaced with something arbitrary at link time. Definition at line 419 of file GlobalValue.h. Referenced by canCreateAliasFor(), computeVariableSummary(), llvm::Evaluator::EvaluateBlock(), llvm::getInlineCost(), llvm::GlobalVariable::hasDefinitiveInitializer(), instrumentMaskedLoadOrStore(), isFuncOrderCorrect(), IsInterestingCmp(), llvm::StackSafetyInfo::FunctionInfo::IsInterposable(), OptimizeGlobalAliases(), and llvm::ObjectSizeOffsetVisitor::visitGlobalAlias(). Whether the definition of this global may be replaced by something non-equivalent at link time. For example, if a function has weak linkage then the code defining it may be replaced by different code. Definition at line 336 of file GlobalValue.h. Referenced by llvm::canImportGlobalVar(), llvm::computeDeadSymbols(), selectCallee(), and llvm::thinLTOResolvePrevailingInModule(). Definition at line 299 of file GlobalValue.h. Referenced by llvm::GlobalAlias::isValidLinkage(), and thinLTOResolvePrevailingGUID(). Definition at line 296 of file GlobalValue.h. Definition at line 320 of file GlobalValue.h. 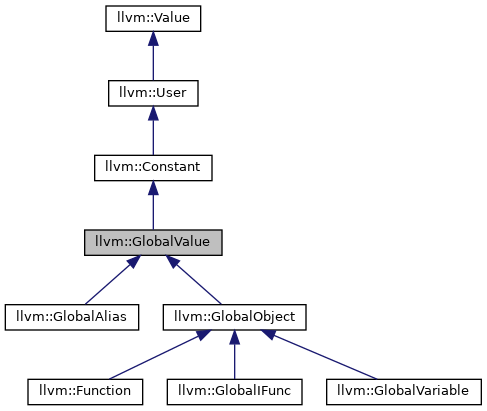 Referenced by computeImportForReferencedGlobals(), llvm::createPGOFuncNameVar(), llvm::FunctionImportGlobalProcessing::doImportAsDefinition(), doImportingForModule(), getGlobalIdentifier(), llvm::getPGOFuncNameVarName(), llvm::GlobalAlias::isValidLinkage(), isValidVisibilityForLinkage(), resolveFwdRef(), selectCallee(), thinLTOInternalizeAndPromoteGUID(), llvm::thinLTOInternalizeModule(), thinLTOResolvePrevailingGUID(), and llvm::thinLTOResolvePrevailingInModule(). If this function's Module is being lazily streamed in functions from disk or some other source, this method can be used to check to see if the function has been read in yet or not. Definition at line 44 of file Globals.cpp. Definition at line 317 of file GlobalValue.h. Returns true if this global's definition will be the one chosen by the linker. NB! Ideally this should not be used at the IR level at all. If you're interested in optimization constraints implied by the linker's ability to choose an implementation, prefer using hasExactDefinition. Definition at line 536 of file GlobalValue.h. Referenced by callsShareTOCBase(), canIncreaseAlignment(), llvm::ARMTargetLowering::CCAssignFnForReturn(), llvm::GlobalVariable::hasUniqueInitializer(), and llvm::TargetMachine::shouldAssumeDSOLocal(). If the value is "Thread Local", its value isn't shared by the threads. Definition at line 246 of file GlobalValue.h. Referenced by llvm::DwarfCompileUnit::addLocationAttribute(), CC_MipsO32_FP64(), llvm::AsmPrinter::doFinalization(), llvm::AsmPrinter::EmitGlobalVariable(), llvm::ExecutionEngine::EmitGlobalVariable(), getComparePred(), llvm::SelectionDAG::getGlobalAddress(), getImplicitScaleFactor(), getModifierVariantKind(), instrumentMaskedLoadOrStore(), isKnownTypeIdMember(), isZeroLengthArray(), llvm::TargetLoweringObjectFileELF::lowerRelativeReference(), llvm::TargetLoweringObjectFileCOFF::lowerRelativeReference(), llvm::TargetLoweringObjectFileWasm::lowerRelativeReference(), and llvm::TargetMachine::shouldAssumeDSOLocal(). Definition at line 329 of file GlobalValue.h. Definition at line 302 of file GlobalValue.h. NB: Using this method outside of the code generators is almost always a mistake: when working at the IR level use isInterposable instead as it knows about ODR semantics. Definition at line 369 of file GlobalValue.h. Referenced by llvm::RecordStreamer::flushSymverDirectives(), getMinVisibility(), llvm::GetOrCreateFunctionComdat(), isKnownTypeIdMember(), mergeConstants(), selectJumpTableArmEncoding(), llvm::TargetLoweringObjectFileMachO::SelectSectionForGlobal(), and llvm::TargetLoweringObjectFile::shouldPutJumpTableInFunctionSection(). Definition at line 456 of file GlobalValue.h. Definition at line 308 of file GlobalValue.h. Definition at line 305 of file GlobalValue.h. Make sure this GlobalValue is fully read. Definition at line 49 of file Globals.cpp. References From, getParent(), llvm_unreachable, and llvm::Module::materialize(). This method unlinks 'this' from the containing module, but does not delete it. Definition at line 72 of file Globals.cpp. Definition at line 267 of file GlobalValue.h. Referenced by copyAttributesFrom(), llvm::FunctionImportGlobalProcessing::doImportAsDefinition(), FunctionNumber(), maybeSetDSOLocal(), OptimizeGlobalAliases(), and upgradeDLLImportExportLinkage(). Definition at line 277 of file GlobalValue.h. Referenced by copyAttributesFrom(), llvm::FunctionImportGlobalProcessing::doImportAsDefinition(), inferDSOLocal(), maybeSetDSOLocal(), and OptimizeGlobalAliases(). Definition at line 163 of file GlobalValue.h. Referenced by llvm::GlobalObject::classof(), llvm::GlobalObject::GlobalObject(), llvm::GlobalObject::setAlignment(), and llvm::GlobalObject::setGlobalObjectSubClassData(). Definition at line 444 of file GlobalValue.h. Referenced by canCreateAliasFor(), llvm::CloneModule(), llvm::createArgumentPromotionPass(), llvm::createBlockExtractorPass(), llvm::FunctionImportGlobalProcessing::doImportAsDefinition(), externalize(), forceRenaming(), FunctionNumber(), getArrayElements(), getOrInsertValueProfilingCall(), handleNonPrevailingComdat(), INITIALIZE_PASS(), instrumentMaskedLoadOrStore(), isKnownTypeIdMember(), LLVMSetLinkage(), makeVisible(), maybeSetDSOLocal(), needsRuntimeRegistrationOfSectionRange(), OptimizeFunctions(), OptimizeGlobalAliases(), OptimizeGlobalVars(), replaceAliasWithAliasee(), llvm::WholeProgramDevirtPass::run(), and shouldKeepInEntry(). Definition at line 171 of file GlobalValue.h. Definition at line 247 of file GlobalValue.h. Definition at line 250 of file GlobalValue.h. Referenced by llvm::GlobalVariable::copyAttributesFrom(), llvm::GlobalVariable::GlobalVariable(), LLVMSetThreadLocalMode(), and maybeSetDSOLocal(). Definition at line 215 of file GlobalValue.h. Referenced by copyAttributesFrom(), llvm::IRBuilderBase::CreateGlobalString(), createPrivateGlobalForSourceLoc(), llvm::createPrivateGlobalForString(), FunctionNumber(), getMinVisibility(), INITIALIZE_PASS(), instrumentMaskedLoadOrStore(), isCallPromotable(), LLVMSetUnnamedAddress(), makeMergeable(), maybeSetDSOLocal(), processGlobal(), and shouldKeepInEntry(). Definition at line 238 of file GlobalValue.h. Referenced by copyAttributesFrom(), llvm::createPGOFuncNameVar(), llvm::createX86RetpolineThunksPass(), llvm::FunctionImportGlobalProcessing::doImportAsDefinition(), externalize(), FunctionNumber(), getMinVisibility(), INITIALIZE_PASS(), instrumentMaskedLoadOrStore(), isKnownTypeIdMember(), makeVisible(), maybeSetDSOLocal(), OptimizeGlobalAliases(), llvm::WholeProgramDevirtPass::run(), and selectJumpTableArmEncoding(). Definition at line 116 of file GlobalValue.h. Definition at line 97 of file GlobalValue.h. Definition at line 90 of file GlobalValue.h. True if the function's name starts with "llvm.". This corresponds to the value of Function::isIntrinsic(), which may be true even if Function::intrinsicID() returns Intrinsic::not_intrinsic. Definition at line 105 of file GlobalValue.h. The intrinsic ID for this subclass (which must be a Function). This member is defined by this class, but not used for anything. Subclasses can use it to store their intrinsic ID, if they have one. This is stored here to save space in Function on 64-bit hosts. Definition at line 158 of file GlobalValue.h. If true then there is a definition within the same linkage unit and that definition cannot be runtime preempted. Definition at line 109 of file GlobalValue.h. Definition at line 94 of file GlobalValue.h. Definition at line 168 of file GlobalValue.h. Definition at line 99 of file GlobalValue.h. Definition at line 96 of file GlobalValue.h. Definition at line 88 of file GlobalValue.h. Definition at line 95 of file GlobalValue.h.